Great Backyard Bird Count Coming Soon! One of my favorite birding "events" of the year is the Great Backyard Bird Count (GBBC) that occurs mid-February every year. This is a great project to do with your kids or grandkids as you only have to participate for 15 minutes. For homeschoolers, this is a great science project to show how field data is collected and compiled for use in various studies. Want to participate? It's easy. Here is a link to instructions. 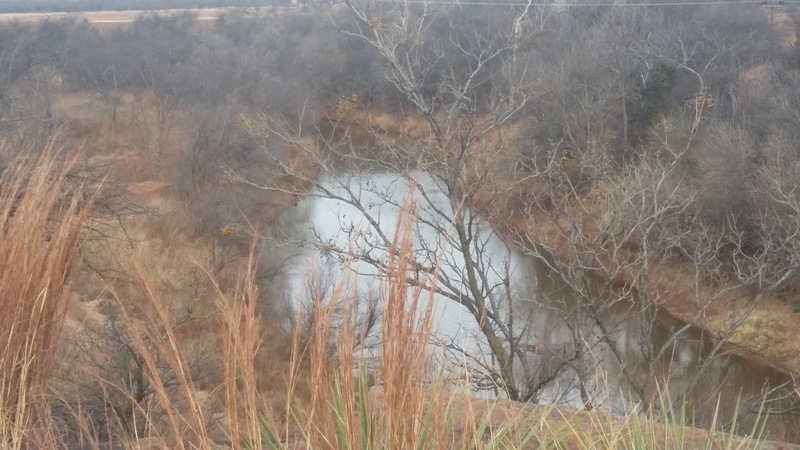 Friday, February 15: 8:00 AM, Wichita Bluff Nature Area, off Seymour Highway. Meet in the parking lot. We'll walk the entire trail to Loop 11 and back (about 2.5 miles round trip). This will probably be the longest in terms of time, so expect around 3 or 4 hours, depending upon the birds. Although not a strenuous hike, it is the most hilly of the GBBC target places. People with limited mobility may find this difficult, but the trail is paved. Saturday, February 16, 8:00 AM, Lake Arrowhead State Park. This is the regularly scheduled monthly bird walk. We usually walk about 1 mile. We take our time, so it normally takes around 1.5 hours. The ground is level, but there are places where we are not on a paved surface surface. Saturday, February 16. TBD. 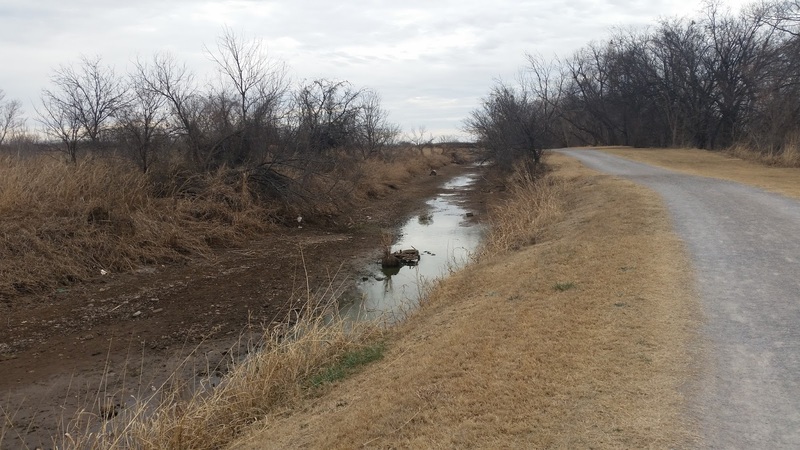 I am thinking about heading from Lake Arrowhead to do a short walk along the Wichita Valley Rail Trail. I have been meaning to hike this trail and haven't yet. The trail is 5.6 miles and I don't have any intention of hiking the entire distance (especially as I would have to walk the return as well.) I thought I would hike a mile or so and then turn around. If someone wants to go, we can iron out the details. The trail is reported to be cinder and gravel. Sunday, February 17, 8:00 AM. Circle Trail between Lucy Park and Williams Park. This is a very pretty section of the trail. We had some good birds here last year. This is not a strenuous walk. There are a couple of low-grade hills. The entire distance is paved. I have never measured the distance but I estimate the walk there and back would be around 2 - 2.5 miles. Monday, February 18, 8:00 AM. 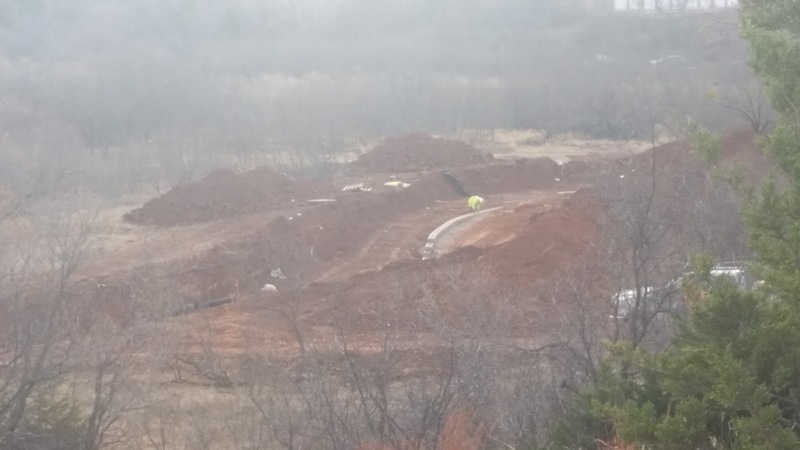 I have some limitations on time on Monday, so my plan is to go to the Chat Trail in Lake Wichita Park and walk around the borrow pit as well. 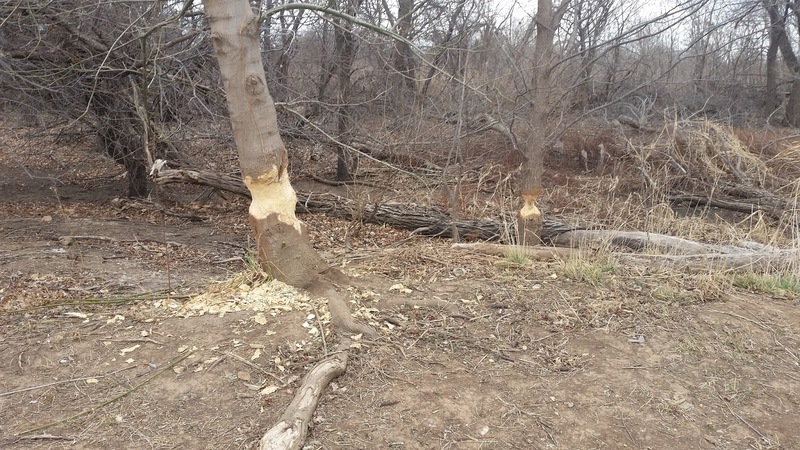 When the birds are cooperative, this is "the" birding location in Wichita Falls. This is a short hike on gravel and some on a paved surface. About a half mile total. If I have time, I may walk more of the trail toward the spillway or along the lake shoreline--weather dependent. Contact me at green.wichitafalls@gmail.com if you would like to bird with me one of these days. It was a cold day, but Lynn showed, so she and I checked out the birds. Admittedly, we didn't go as slowly as usual and finished the walk in just over an hour. That being said, we found some good birds. 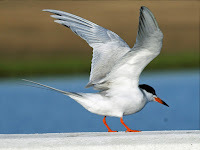 The best birds from my point of view were the Bonaparte's gulls and Forster's terns. We had only one woodpecker, a northern flicker, seen within just a couple of minutes of me saying, "I haven't seen any flickers this winter." Not a bad hour on a cold morning. 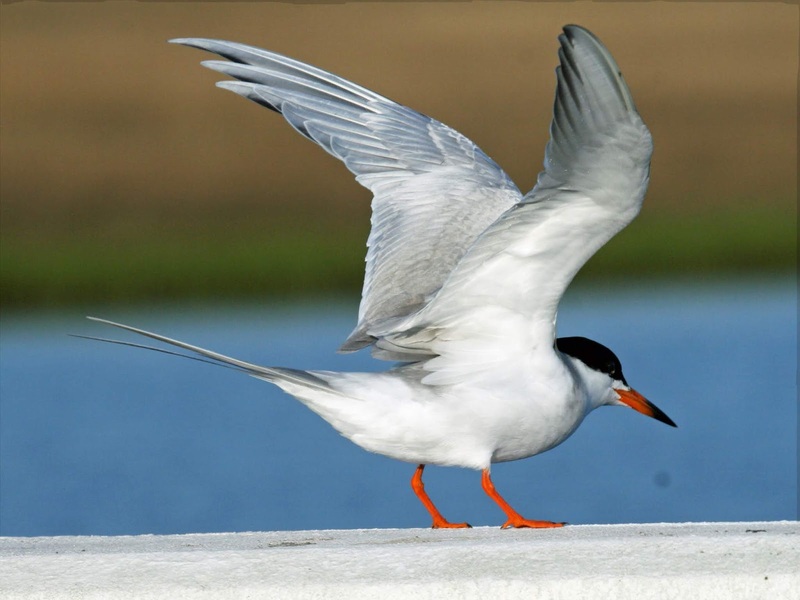 Don't forget the monthly bird walks at Lake Arrowhead SP are on the 2nd Saturday of each month, starting at 8 AM. Park entry fees apply--get there a little early as the ranger station won't be open yet, so you'll need to make out your fee envelope. We meet at the dump station area (2nd left after you enter the park, then the first right, on the left). Kids and novices are welcome. Gulls are tricky to identify. Not only are the birds largely similar, but it takes multiple years for the birds to reach mature plumage and the plumage differs by age. To make things more fun, there can be a fair amount of variation within age groups. For most of our birds, we learn male, female, immature, and possibly nonbreeding. If you live in an area where gulls are common, you would have a motivation to study and get good with identification. Here in the Wichita Falls, TX area, we only get gulls in the winter and 95% or more are ring-billed gulls. 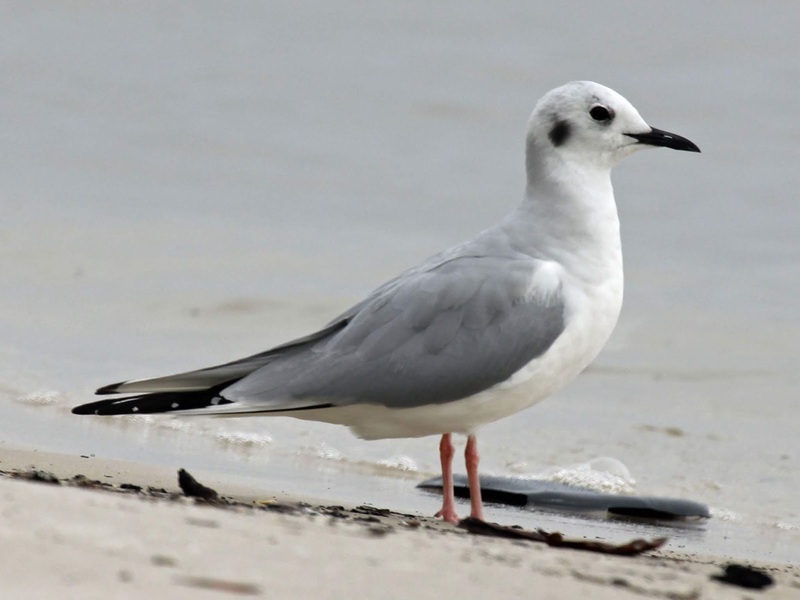 Consequently, many locals identify gulls as a "ring-billed gull" or "not a ring-billed gull." 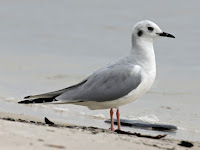 We really have to have time to study a gull to have a hope of making an accurate identification--and we are hoping we have adult plumage to work with. Many of us have more "gull species" than clearly identified species on trip lists. 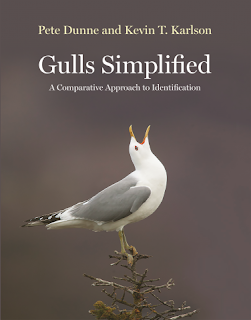 Princeton University Press sent me a review copy of Gulls Simplified: A Comparative Approach to Identification, by Pete Dunne and Kevin Karlson. What makes it especially useful are the numerous pictures (330 color photos). The species accounts are focused on identification which is the purpose of the book. There are lots of pictures with a discussion of what field marks to look for and where you may get confused with another species. There isn't a lot of text, but there is some commentary on those traits that experienced birders notice that can make a difference in deciding between two species. For example, the Great Black-backed gull is referred to "chestier" than a Herring Gull and its gait is referred to as a "waddling sailor's gait." To a non-birder, this may not seem to be anything other than literary description, but it is precisely these things that allow a birder to identify similar species quickly in the field. Overall, this is an excellent book to hone your gull identification skills. It isn't a book to take into the field, but a great supplemental reference to use when you get back to the house with your field notes and/or photos. 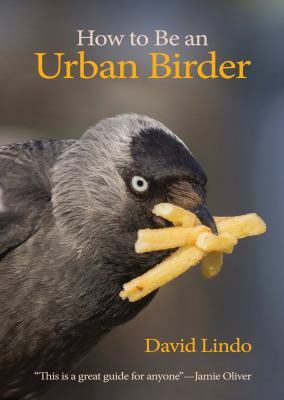 I very much enjoyed the book, How to Be an Urban Birder by David Lindo, sent to me by Princeton University Press for review. But before I even opened the book and read the first word, do you know what caught my eye? The author, David Lindo, is not white. That seems wrong to notice that first, but at least here in the U.S., birding is predominantly a hobby enjoyed by white people. I am not sure why that is as birding is one nature activity you can do anywhere, but it seems to be a hobby by those who can get out of town into the countryside. Which is unfortunate. Those of us who bird know how endlessly fascinating birds are, and I would love to see more people enjoy the hobby and gain a greater appreciation for the creatures that share our world. This book is a celebration of birds and birding in places we don't think of as good birding locations--our urban environment. If you ask someone what birds you are likely to see in a city, the most likely responses are pigeons, starlings, house sparrows, and similar birds. But I have been in many large cities and seen some excellent birds. It's a matter of looking. Lots of photos of birds seen by the author in his urban environment show how much more is possible. And that really is the point of this book. We can introduce people to birds and nature anywhere, building an appreciation of the environment they might not otherwise have. As more and more people live in urban areas, it becomes harder to connect people to nature. As David Lindo says, "If we can learn about the importance of wildlife conservation in our cities then we will understand the connection in the general web of life on this planet, enabling us to reach out and strive to protect the rest of the world's fauna and flora and ultimately, ourselves." Mr. Lindo is based in England, and that was much of the fun for me. I lived in England for a few years, so it was fun to read some of the expressions I had forgotten and to see pictures of some of the birds that were so familiar when we lived there, but I haven't seen since we returned to the U.S. This is a good book for a new birder. He writes about field guides, binoculars, telescopes, cameras and all of the other paraphernalia birders tend to accumulate. There is a chapter on creating a more bird-friendly yard. Scattered throughout are examples of the things many cities are doing to improve the urban environment for birds, wildlife, and people. 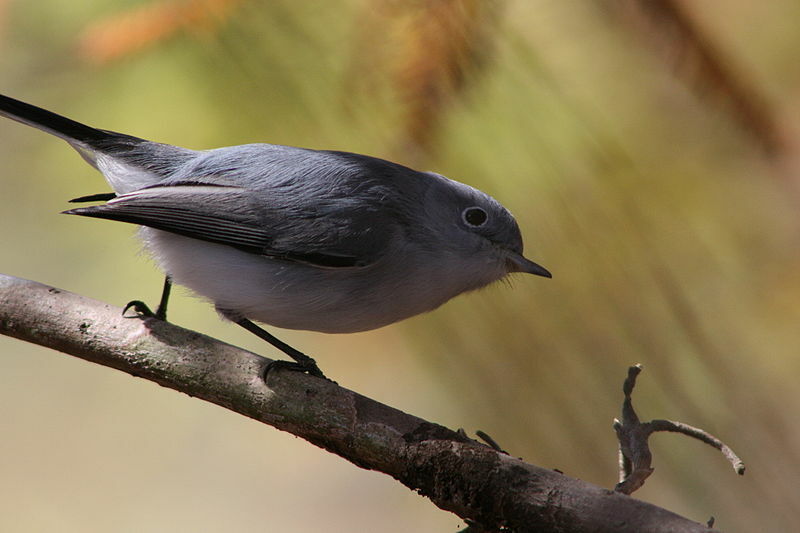 Whether a new birder or one more experienced, this is an interesting read. You can find this book on Amazon for $15.45 or from Princeton University Press for $18.95. Yes, Fall Migration is Upon Us! Tuesday night at the North Texas Bird and Wildlife Club we discussed sightings, as we always do. I didn't have a lot to contribute (except a Hudsonian godwit at Lake Arrowhead SP I saw September 8.) I haven't been out much. I told everyone that with the front expected to come through with significantly cooler temps, I was going out this weekend. Today was the day, and I am very glad I went. It has been raining since Thursday night. This morning has been a light drizzle on and off, but nothing of significance. I decided to hit the Chat Trail at Lake Wichita Park since it is usually a great spot for migrant warblers. I was starting onto the trail and noted two raptors high up, circling. They reminded me of ospreys, but I couldn't get a good look so decided it was wishful thinking. Later, back by the borrow pit, an osprey flew low over my head with a fish clutched in his talons, so it seems very possible the birds I saw at the head of the trail were indeed osprey. Regardless, I know the one was. As it turned out, the warblers are moving through. I saw several common yellowthroat, a Wilson's warbler, two blue-gray gnatcatchers, a mourning warbler, and others I didn't get a good enough look at to identify. There were also some interesting calls that I recorded. I also got a good look at a clay-colored sparrow. My favorite sparrow spot was an excellent spot for warblers today. I saw a hummingbird zip by but didn't see enough to identify the species. But if you have a hummingbird feeder up, don't take it down yet. Don't let a little rain keep you in the house now that migration has hit its stride. There are some great birds out there. I haven't been birding much over the summer. I hate hot weather, and the birds aren't thrilled with it either. I finally decided I was going this morning. 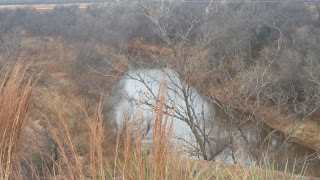 It was sprinkling and looked like the rain could get heavier, so I decided to go to the Chat Trail in Lake Wichita Park instead of the Nature Bluff section of the Circle Trail. The good thing about going birding when there is a little rain is you have the parks to yourself--Wichita Falls people don't go out in the rain. The decision to go birding turned out to be a good one. I didn't see a lot of birds on the Chat Trail, but I saw some good ones. 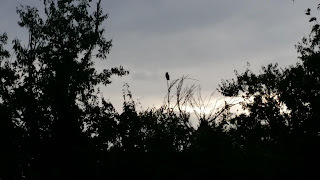 When I got out of the car at the parking lot, I saw a large bird perched in some dead branches in the top of a tree a good way down the trail. It was a great horned owl, so things were starting out pretty nice. I am including a short video clip. I took it with my phone, so the picture is not the greatest. I also didn't do a very good job of holding the phone steady. If you listen carefully, you can hear him calling. But that wasn't the best part. I didn't catch it on video, but there was a second great horned owl in the wooded area behind me that occasionally called back. I was pretty stoked about this, but I walked further down the trail, near the bridge and heard another great horned owl in the wooded area over by the dam. Then heard another behind me again. All of a sudden, the one behind me flew over my head toward the owl calling by the dam. I got my binoculars on the one in flight and saw it fly into the trees and flush out the other owl. That was four great horned owls. I don't think I have ever seen that many in one small area, ever. When I was coming back to the parking lot, the first great horned owl was still on the exposed branches, but he had been joined by an immature Mississippi kite and a Cooper's hawk. I was surprised by the Cooper's hawk, as it is a little early for them. The birds finally flushed the great horned owl and chased it back across the trail toward me, and there was a second Cooper's hawk in pursuit as well. I didn't see a lot of birds this morning, but then I didn't stay out long--the rain did get a little heavier while I was out. I'm glad I decided to go. Here's the complete list. The Great Backyard Bird Count was February 16 - February 19. I took part all four days, although I would have liked to have been able to get to more locations. But we do what we can, right? 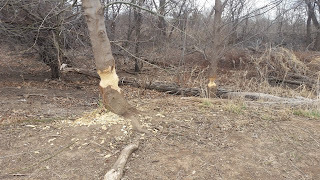 You don't often see the beavers, but you can see they've been busy! The first day of the count was not promising. The temperature was in the low 80's the day before and the first day of the GBBC was low 40's with a bitterly cold north wind. I decided the Chat Trail in Lake Wichita Park would be my best bet as it has some shelter from the wind. But there wasn't much happening--the birds apparently had more sense than I. I only spent 45 minutes on the trail and at the end of the barrow pit. I went home and did a quick, 15-minute count at my own feeders: white-winged dove, Eurasian collared dove, house finch, American goldfinch, orange-crowned warbler. Monday was another beautiful morning. I didn't have President's Day off work, but did play hooky for a bit on the Wichita Falls Bluff Nature Park trail. This is my favorite park because it is intended to remain a nature area. I started out in a bit of a bad mood. When I parked, I noticed people are already trashing the park. I picked up beer bottles, a plastic water bottle, plastic shopping bag, and a hamburger wrapper before I even started my walk. I picked up napkins, a Whataburger bag and other assorted odds and ends when I returned to the lot at the end of my walk. Fortunately, the trail itself was clean. I spent an hour and a half enjoying this trail, which is not the level flat walk of most of the Circle Trail. They have started work on the next section of the trail, between the end of this one and Loop 11. Right now, it looks terrible, but when it is done, it should be another nice section along the river. At the end of the current trail, where I took the pictures, there were a pair of red-tailed hawks on the other side of the river. It looked like they might be building a nest. I'll keep an eye on things. All-in-all, a great Great Backyard Bird Count. I still need to upload my counts into the database, but that's happening in a few minutes. Put this event on your calendar for next President's Day weekend.